Porcelain Sign Collecting - Genuine, Fake or Reproduction? How To Tell By One Of The Worlds Top Authorities - backed by over a century of experience in museum quality fine art from Chippendale to American classics. If you're a novice or seasoned collector of porcelain signs and would like to understand them more, there are a few things you should know. Porcelain sign reproductions can be collected if you would like to own a specific sign image without having to pay top dollar. Among top porcelain collectors, Dog and Suds Neon, Musco, Sherwin Williams "Cover the Earth" Clipper, and Kelly Tires - just to name a few - are considered the "Holy Grails" of porcelain signs where prices can range up to $60,000 or even more if they are neon. Real porcelain sign collecting is not for the faint of heart, investment wise, so an alternative (even though not investment quality) would be reproduction signs just for decoration. However, keep in mind that reproductions signs will never have investment value. We recommend you invest in authentic sign collecting, and stay away from the fake signs. There are many details you should know before you start investing in porcelain sign collecting. Being able to tell the difference between an authentic porcelain sign and a reproduction takes years of experience to be done with certainty. There are several ways to distinguish between what is real and what is fake. First of all, most reproduction signs are marked as such and are never meant to deceive. 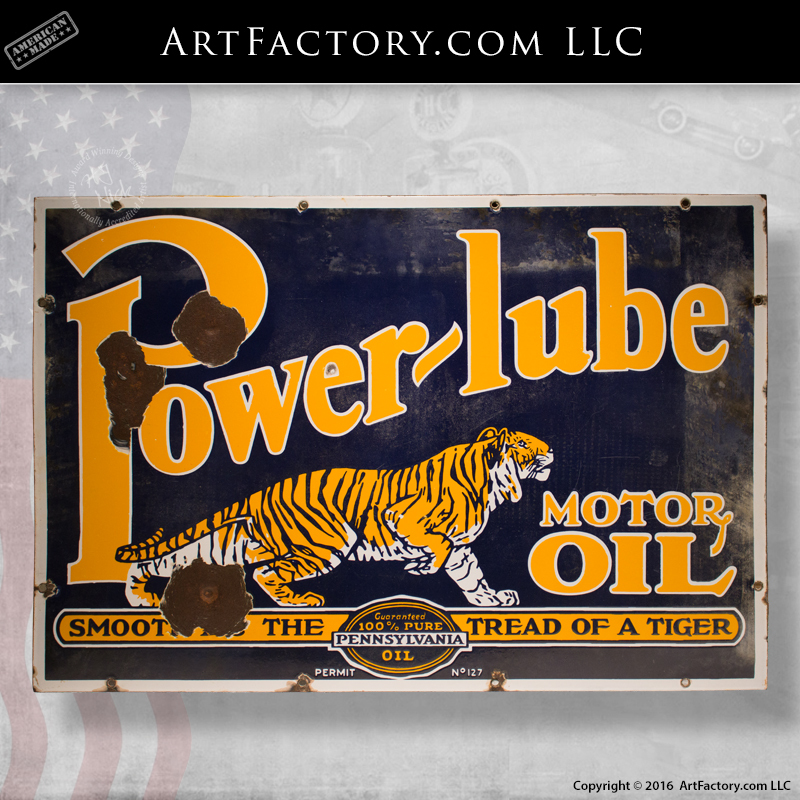 That being said, there are some people out there who may sell reproduction signs for higher prices they don't deserve, which is why you must be prepared before advancing into this appreciable asset hobby. See our vintage signs and genuine collectables to get started. We have hundreds of authentic signs for sale, and we guarantee authenticity. How the mounting holes of the signs are placed is just one of the ways to determine if the sign you are looking at is real or fake. Some companies only made one sign with one specific design. If that sign has eight mounting holes and the sign you're handling has six, that's a red flag for it being a reproduction. However, it is sometimes hard to find the manufacturers specifications, and not all sign experts agree. In the same scenario, if you see a sign that is a completely different style than what you are familiar with, it could be a fake. In other words, if the company only produced an oval sign and you are inspecting a die-cut, that is also a red flag. Of course, finding out if the company only produced an oval sign is also problematic due to the limited sources available. Solid brass grommets were also used by many companies, and placed inside the mounting holes. This was done to protect the edges of the sign. Many reproductions also have brass "plated" grommets. An easy way to tell if the current sign you are looking at has real grommets, it should look as though it has been used and hung many times. Of course if the sign in question has never been hung outside, or is new old stock (NOS) this becomes a difficult to determine authenticity. A problem in the industry involves some unscrupulous people will attempt to "age" new signs by burying them or chemically rusting them artificially to fake a vintage look on new reproduction signs. Use your own judgment, or contact us for a free expert assessment at 1-800-292-0008. In our opinion, it is very hard to discern from grommets the authenticity of a porcelain sign, and is best left up to the real experts that will guarantee grading and authenticity until you are confident in your skills. We sell certified signs. Another factor of determining authenticity is the general quality of the porcelain sign. This involves a thorough inspection of the sign. In the beginning these companies having signs made enlisted the help of professional porcelain enamel sign makers to construct and paint their symbols of advertising. How the porcelain enamel is laid out shows the difference between a legitimate sign and an imitation in most cases. Please keep in mind the original authentic porcelain signs were created by professionals and were perfect. All lettering was straight with absolutely no wavy appearance; most lettering on a reproduction can be seen as curvy as well as cartoon-ish. The layers of porcelain can also show if the sign is a counterfeit. On the original porcelain signs the first layer applied was the white enamel and all other colors were layered on top of that. If you come across a sign where the paint is flush, odds are, it could be a fake. Best way to tell is by running your finger across the colors, if you can feel the difference in heights of the colors, most likely, it's a real sign - or consult us for certainty 1-800-292-0008. How the stamping is displayed can play a big role in determining real or fake copy. These stamps can provide the date the sign was registered, or the company that created it. Some reproduction makers slightly modify these stamps. For example, where the stamp states REG., some reproductions change it to RED. Also keep in mind that not all signs were stamped by the maker and will force you to determine if the sign is fake another way. These details will help you decide if a sign is real. Don't be intimidated, take your time, focus on these points or get a experts certification. Keep in mind a real sign collection is a true investment and will appreciate in value, so it may be worth paying for a certification that will reimburse you if they are incorrect. Free certifications are only opinions usually by self appointed experts and can not be trusted. Provenance is one of the best ways to determine the authenticity of your sign. Knowing its history, where it came from, a photo of it in its original location, and the date the photo was taken, for example, provide verifiable history by the seller of its origin. This kind of porcelain sign is going to be of the highest value, bar none. For example, if you can tie the vintage sign to famous places in history, movie stars, or other famous people or events, etc. this will increase the value of the sign. Porcelain Sign Collecting: Beware, Fakes Are Everywhere! Fake porcelain signs and restored low grade real signs are sold everywhere. Please keep in mind a restored or doctored real sign is also of little value. These kinds of signs are more likely to be found on eBay, Craigslist, and flea markets, but these are not the only places we see them. It is not unusual to see a "vintage" collection that is 90% authentic signs, and 10% reproduction signs. You should never assume that just because a sign is surrounded by originals that there are no fake signs in the collection. Also a high asking price for an old sign never guarantees it to be genuine. When examining a sign to determine if it is authentic, take out all of the other variables and just look at the sign. If it takes you more than a minute or so to decide if it is genuine, then you need an expert opinion. 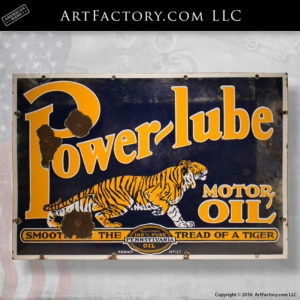 Call ArtFactory.com at 1-800-292-0008 and we can tell you if your sign is real and what it is worth. All signs purchased from us are certified real, and carry a money back guaranteed back by over a century of antique experience on everything from Chippendale furniture and fine art, to gas pumps and classic vintage signs.